Don't miss your opportunity to join this brilliant Northern Lights hunting tour, travelling by minibus to discover one of Iceland's most beautiful, mysterious and elusive winter attractions. This is a great tour opportunity for those guests desperate to see the Aurora Borealis during their time in the country, as well as those hoping to maintain an element of luxury whilst doing so. One of the great benefits of this tour is the V.I.P treatment; throughout the experience, you will have access to some great company, traditional Icelandic hot chocolate and cookies, history and cultural trivia and, of course, the Northern Lights themselves. 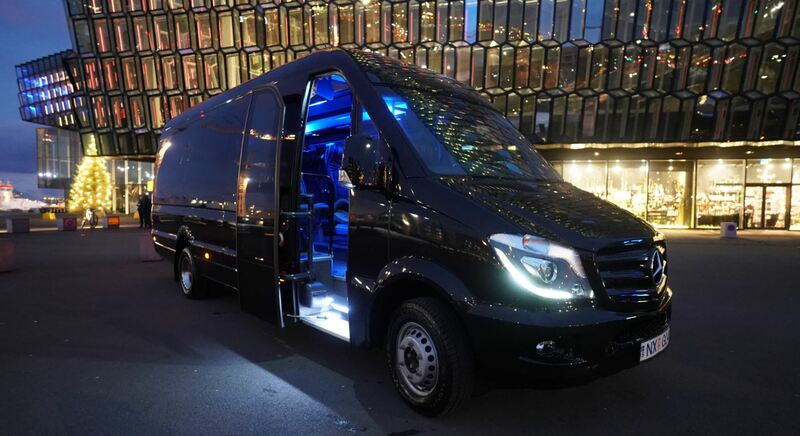 Travelling from spot to spot, you will be seated comfortably in a new, modified Mercedes Benz luxury Minibus (maximum: 16 passengers), boasting plenty of leg room and a panoramic roof from which to stare at the Northern Lights. There is also WiFi on board, meaning you can share the experience with your friends through social media, or even download some aurora-related apps. Once you are out into the tranquil darkness of the Icelandic countryside, you will step out of your vehicle to appreciate and photograph the Northern Lights above you. Fear not if you are concerned about the correct camera settings—you driver/guide will be with you every step of the way to take you through the process. Of course, the Aurora Borealis is a natural phenomenon, meaning that there can be no certain guarantee of seeing them. With that being said, it greatly increases your chances of seeing them when out with a tour group, this is thanks to the expertise and prior-knowledge of your guides. If conditions look unsuitable for Northern Lights hunting, the trip will be rescheduled for a later date. If you don't happen to see the Northern Lights during your trip, we will attempt to reschedule you for the next available tour. 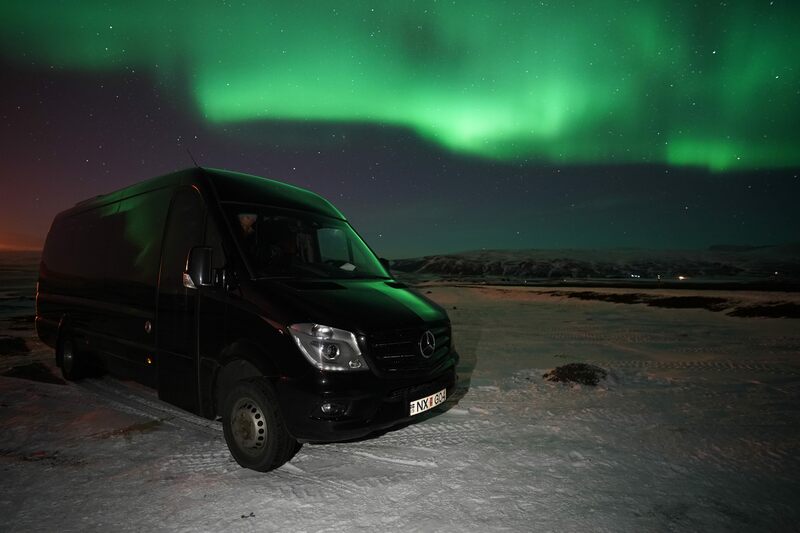 Hurry now and you too can experience one of Nature's greatest artistic displays with this Northern Lights hunting Minibus tour into the dark, Icelandic countryside. Check availability by choosing a date. Pickup time : 20:30, 21:30. Please be ready at your hotel or bus stop and note that pick up can take up to 30 mins. Please note the Northern Lights are a natural phenomenon and it cannot be guaranteed that you will see them every time. If you do not, then there is the Northern Lights Guarantee, meaning you will be rescheduled onto the next available trip. If conditions appear unsuitable for Northern Lights hunting, then you will be rescheduled onto a later tour. we did a northern light tour with Guide to Iceland and it was awesome. We could watch the lights at first try, the minibus was very confortable and the crew really friendly. Our guide helped us with the cameras and took us an amazing photo with the lights. We were very lucky as the weather was not perfect, we had very cloudy sky and began to snow right after we could watch the lights. Our driver tried very hard to find two different spots to catch this incredible nature sights and after that we returned to Reykjavik as it had no sense continue the tour with such a bad weather. But it was an amazing experience that I recommend to everyone who visit Iceland. Comparing to other companies that we met, Guide to Iceland is a very good option, it offers small group tours, which is an advantadge when you want to see the lights without a crowd. 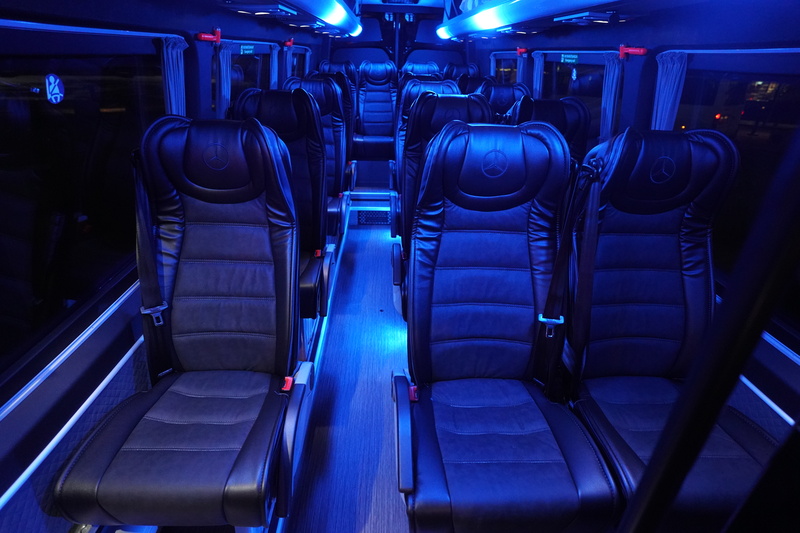 Also the minibuses were confortable, although they should clean their crystal ceiling as it would be perfect for the people who want to get warm inside. The Northern Lights tour was wonderful. The pickup was punctual. The minibus was very comfortable. Lucas, the driver/guide was wonderful. He was witty, knowledgeable and helpful . Updates on the latest viewing places were provided and we were taken to a place outside the city for viewing the Northern lights. Beside giving tips on viewing northern lights, he helped us setup our tripod and camera equipment . We were lucky to see the Northern Lights which was a wonderful experience. Enough time was provided to view the solar flares . Hot Chocolate was provided which was a nice touch. All in all, this was a great tour and we absolutely recommend it to anyone interested in seeing the Northern Lights! This tour was a great time. Pickup and dropoff were punctual. The minibus was very comfortable. Our guide was knowledgeable about how the Northern Lights occurred and where to best see them. He even gave us tips for best photography either on cameras or phones. The hot chocolate and cookies were a comforting touch! We were lucky and saw the northern lights (which is totally up to nature and not our human planning). 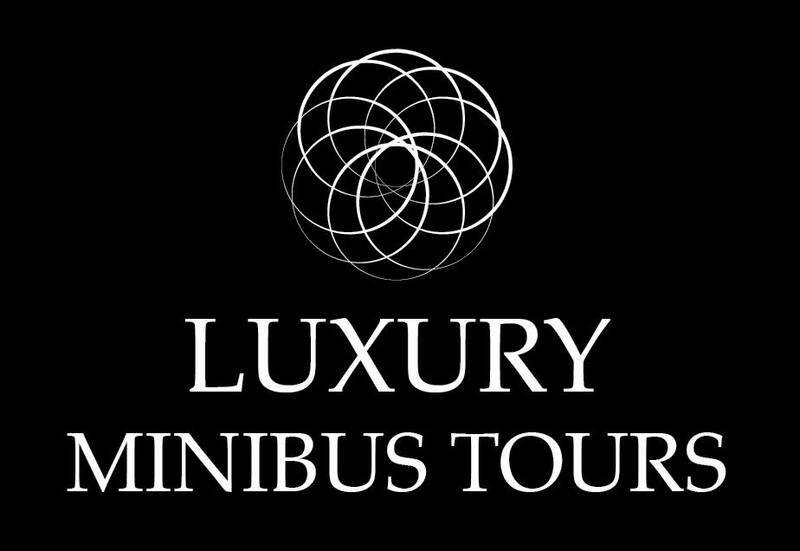 From what we read, a smaller tour like this allows you more flexibility and is less crowded than larger group tours, allowing for a more pleasant experience. This was a very nice finish to our trip in Iceland. We would absolutely recommend this tour! Honestly very dissatisfied. So my tour was supposed to be on Tuesday the 16th but that got canceled due to weather, they ended up rescheduling it for the 17th. We got picked up first and than had to pick up the rest of the 14 people. This was supposed to be a 4 hour tour. The complete tour lasted an hour and a half because the driver felt that it wasn't worth being out because of the cloud cover and the weather and it would be better to just go to sleep and try again the next day. He mentioned to the group that we could rebook. So we rebooked for Thursday the 18th and that was canceled and than I tried the 19th and that was canceled again (both due to weather). I contacted guide to Iceland to see about a refund. I didn't want a full refund put partial at least a partial and was told no because we went out that one day. Now I get it you won't always get to see the lights but we had really no chance to see it on the day that we went. I'm not really sure why we even went out..We weren't even out long..I spent a lot of money ( just about $200.00)on just being out for an hour and a half. I really wish that we could of gotten something back.